Bus from Batu Pahat to Butterworth is the most preferred transportation option to Butterworth from Batu Pahat. Bus is the only option to travel from Batu Pahat to Butterworth because there is no airport and train station available in Batu Pahat. Many students and working adults rely on this service to go back and forth for study and work purposes. 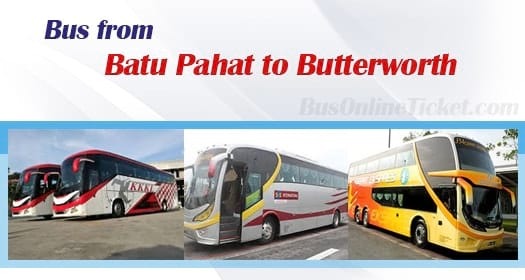 KKKL Express, S&S International Express, and Cepat Express are the only bus operators serving bus from Batu Pahat to Butterworth. KKKL Express is the only operator providing morning departure at 9:30am. There are more departures in the evening in which the bus would arrive next morning at Butterworth. Most passengers prefer overnight bus because it saves their precious day time and spend the journey in the night. S&S International Express and Cepat Express each offer 1 daily evening departure while KKKL offers 2 daily evening departures . The travel time from Batu Pahat to Butterworth takes about 9 hours, depending on the road traffic condition on the travelling day. The bus fare is charged in a range of RM 56.80 to RM 62.00, depending on your selection of bus operators. Both S&S International Express and Cepat Express offer child fare ticket at RM 42.70 and RM 42.60. At least one washroom break will be given. The pick-up point in Batu Pahat is in Batu Pahat Bus Terminal. Passenger can easily access to Batu Pahat Bus Terminal because it is located at Batu Pahat town area. The arrival point in Butterworth is in Penang Sentral Bus Terminal. Online booking in BusOnlineTicket.com is simple and convenient. Now it is even more convenient by booking bus ticket online at BusOnlineTicket.com with instant confirmation. As long as you have internet access, you can book your bus ticket online at BusOnlineTicket.com anywhere, anytime, and any place at your convenience.